New contests surface every day on Twitter, with a large variety of prizes up for grabs. Recent contests have given away everything from netbooks to gas cards to $25,000 for a new car. Twitter giveaways are like the lottery, only your odds of winning are dramatically higher, and you can enter as many contests as you want without spending a dime. With some strategy and a little patience, you’ll soon discover how addictive Twitter contests can be--especially when you start winning cool prizes. Even with recent studies showing that Twitter’s growth is slowing, Twitter contests aren’t going away anytime soon. Most of the contests are from companies looking for you to mention their products or brands in your tweets. If you've got some time on your hands and don't mind some mild spamming (we'll explain how to do it without causing your friends to unfollow you), you can take advantage of this growing marketing phenomenon. Follow this guide and start winning prizes while you tweet. Most people haven’t found their calling on Twitter: 60 percent of Twitter users give up on the micro-blogging service within a month of creating an account, usually for lack of concrete reasons to tweet. So for the Twitter quitters out there, consider contests an incentive to tweet again. If you’re new to Twitter, or if you’re a little rusty, brush up on your Twitter skills before diving into the world of its contests. Several friends of mine recently tapped into the Twitter contest trend, and their contest-related retweets and excessive hash tags became an eyesore. You probably have to tweet to win, but that doesn't mean you need to lose all of your followers in the process. If you create a new Twitter handle for entering contests, you'll avoid annoying the followers of your main account, and help keep your contest entries separate and organized. Start your search for Twitter contests by following all of your favorite companies and products on Twitter. Just click the “Find People” link on your Twitter home page and search for company names, or run a few Google searches. Also look for “Follow Us on Twitter!” links on company Web sites. Once you’ve added all of your favorite Twitter-savvy companies, you’ll be the first to know when they launch contests. Some results on Twitter Search that you might see when you search for "contests." 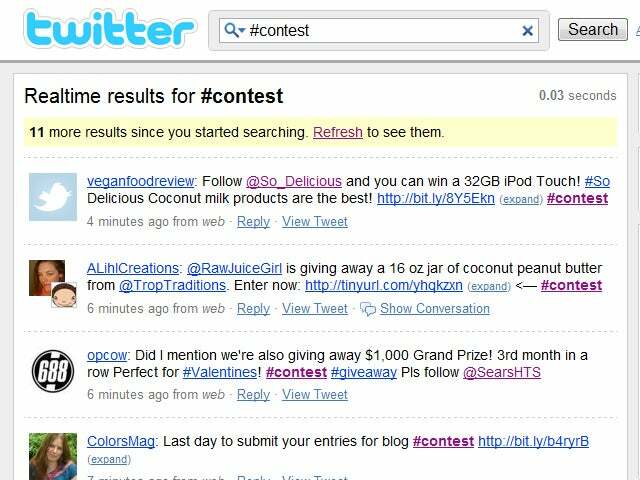 If your favorite companies aren’t currently promoting any contests (and you don't mind endorsing a company or product you may not actually be familiar with), use Twitter Search to find tweets with words like “contest” and “giveaway.” Keep in mind that not all Twitter contests are legitimate, so enter only contests for companies that you know or that check out. For information about more Twitter contests, visit Twitter Contests on the Sweepstakes Forum, or search on Google. All contests operate slightly differently, but most have similar traits. People and companies in charge of giveaways typically require users to follow them as part of the entry process. And for those users to enter for specific prizes, they’ll usually request that followers retweet a specific message or include a particular hashtag in their entry tweet. In other contests, you might have to be the first to @reply to the contest sponsor with a trivia answer, or you may be asked to write, say, a creative 140-character verse integrating specific hashtags. Many contests allow you to enter only once, and other contests encourage as many entries as possible. Be sure to carefully read the rules of each contest, which can almost always be found on the sponsoring company's Web site. A view of multiple entries for a contest. If a contest allows multiple entries, set up a HootSuite account and schedule all of your entries for the coming week or month. This way, you can set up a month’s worth of entries at one sitting. 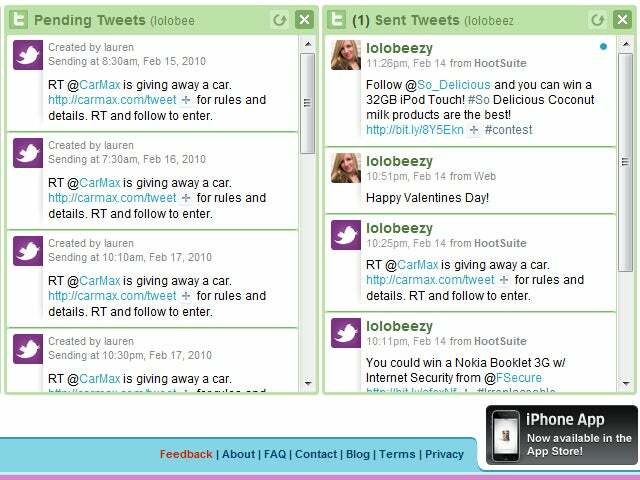 HootSuite is also very useful for finding new contests. Set up a permanent keyword search for the terms “contest”, “giveaway” and “sweepstakes.” Search results will continuously stream in. You can even retweet directly from HootSuite--just hover over a tweet, and a retweet logo will appear. Once the winner is determined, contest organizers will usually contact the winner on Twitter with an @reply or a direct message. If you win, it’s your responsibility to reply with your shipping information so the contest host can send the prize to the right address. Again, all contests run a bit differently, but prizes tend to ship promptly, anywhere between one day to three weeks after the winner is announced.